Manna bread is a delicious unleavened product made from sprouted grains. The bread may be produced from whole grains and water alone or may have added fruit, nuts, and seeds. It contains no yeast, added sugar, salt, oil, or preservatives, is cholesterol free (like all plant foods), and is suitable for vegans. The sprouting process and the simple recipe produce a dense, nutritious, and tasty product. Some people make their own manna bread at home. Others find it more convenient to purchase the bread in a store. The version that I buy and that I'll review in this article is produced by the Manna Organics company in Illinois. Their bread is certified organic, kosher certified, and made from non-GMO ingredients. It comes in nine different varieties, ranging from plain grain breads to loaves that contain fruit, nuts, or seeds in addition to grains. The basic steps in making manna bread are to sprout the grains, blend them with water in a food processor to make a dough, put the dough in a pan, and bake it. Some people who make their own manna bread like to eat "raw" food and place the dough in a dehydrator. They leave the dough at a low temperature for a long time to turn it into a solid bread. The Manna Organics website says that their sprouted grain breads are "slowly baked at a temperature much lower than conventional bread". They don't offer any more details about their sprouting and baking processes because their preparation method is proprietary. 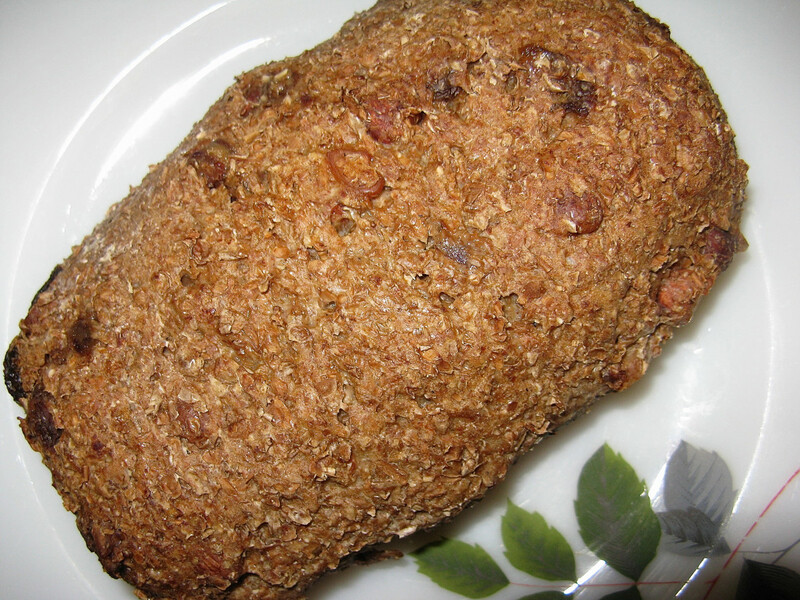 Manna bread is sometimes called Essene bread. The Essenes were an ancient religious sect. Both of the names for the bread are based on the idea that earlier people ate or made this natural and nutritious product. According to the Bible, manna was a food provided by God. Manna bread contains simple ingredients. Since the bread is minimally processed, many of the nutrients in the ingredients are retained. 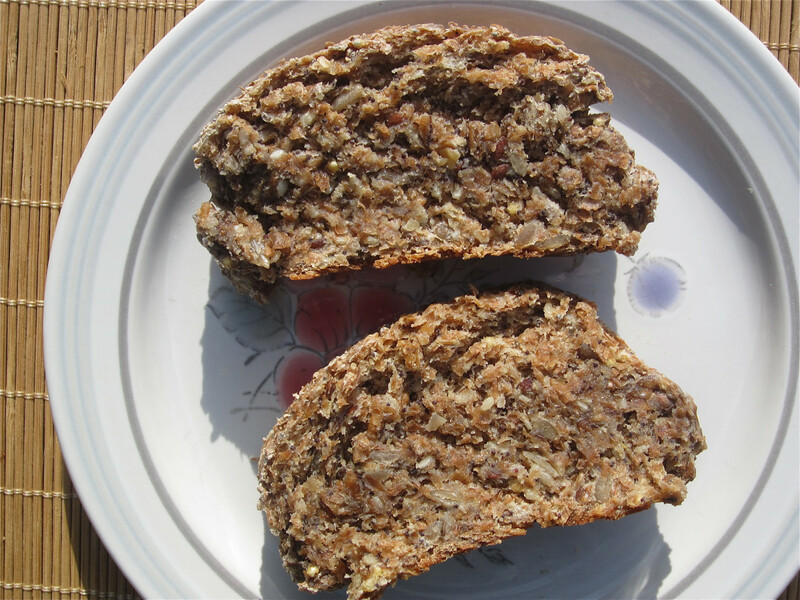 The Manna Organics version of manna bread contains whole grains and is high in insoluble fiber. 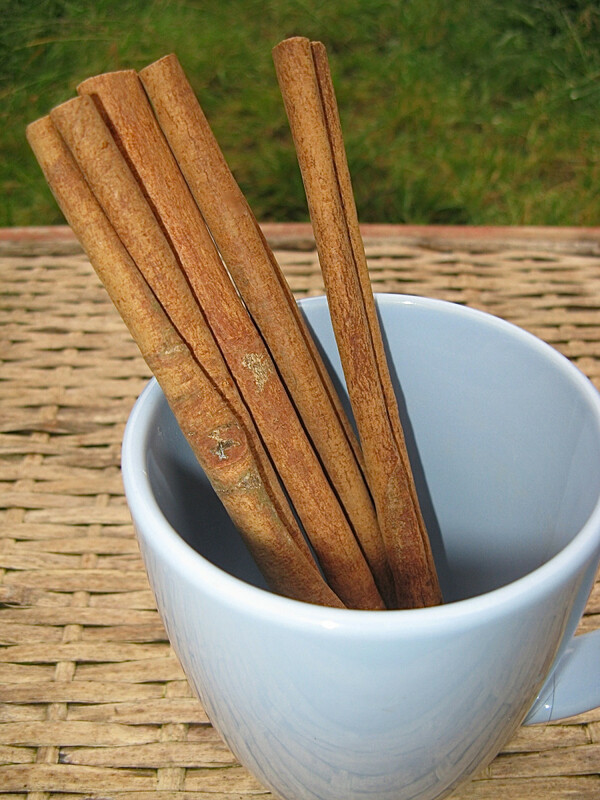 This type of fiber provides bulk to the stool and helps it move through the large intestine. It may also reduce the risk of some diseases. Whole grain bread is far healthier than white bread, which has had the bran removed. 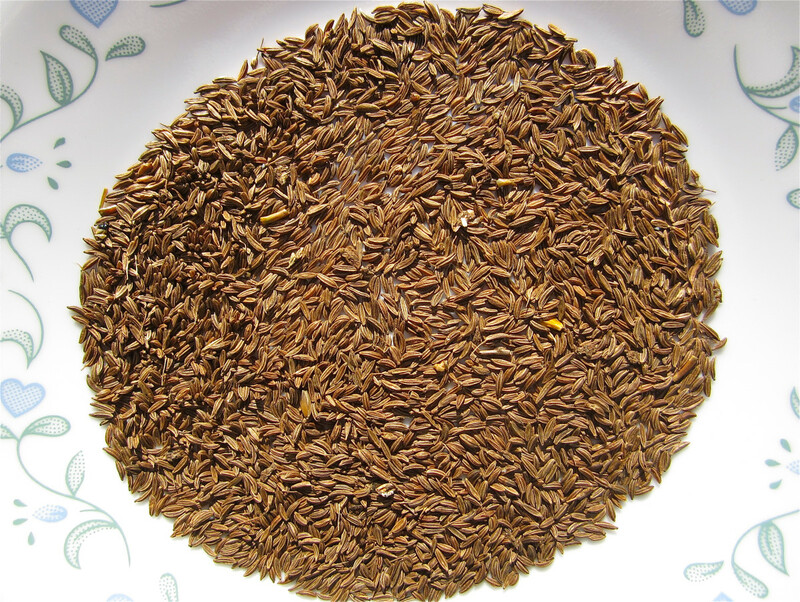 The bran is the outer layer of a grain kernel and contains insoluble fiber. Manna bread also contains soluble fiber, which can reduce the level of LDL cholesterol in the blood. This type of cholesterol is often referred to as the "bad" cholesterol. The various varieties of the bread are high in protein. They are very low to moderately low in fat. The nut and seed versions contain a little more fat than the plain grain versions. The whole grains in the breads provide useful vitamins and minerals. The fruits, nuts, and seeds that are added to some varieties of the bread supply more vitamins and minerals. 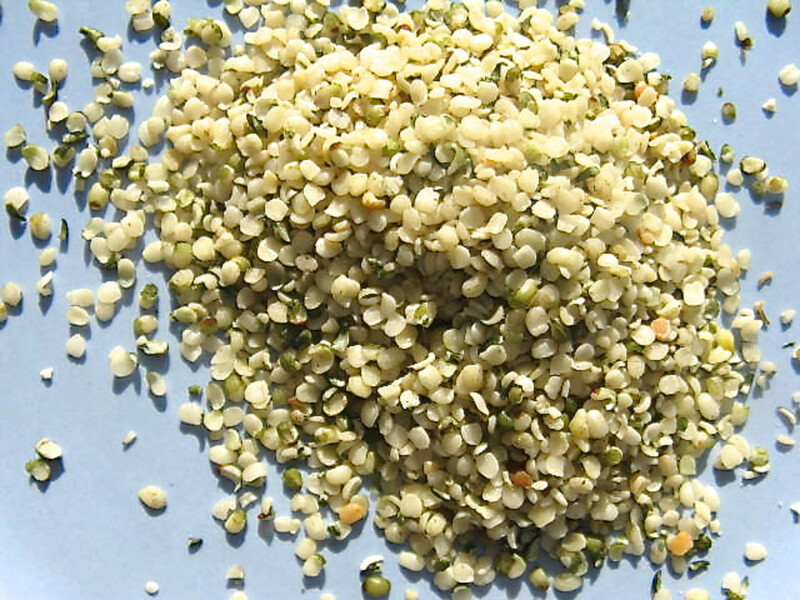 The flax and hemp seeds in the bread contain omega-3 fatty acids as well as other beneficial nutrients. Omega-3 fatty acids may reduce inflammation, lower the risk of heart disease, and reduce the triglyceride level in the blood. Manna bread contains a moderate amount of natural sugar. The fruit and nut version contains a lot of natural sugar, however. A buyer might want to save this version for a special treat. The sprouting process causes complex carbohydrates to change into simple sugars, such as maltose, which gives manna bread its sweetness. I don't find this sweetness overpowering, though. The bread varieties without fruit taste mildly sweet to me, while the varieties that contain fruit are sweeter. 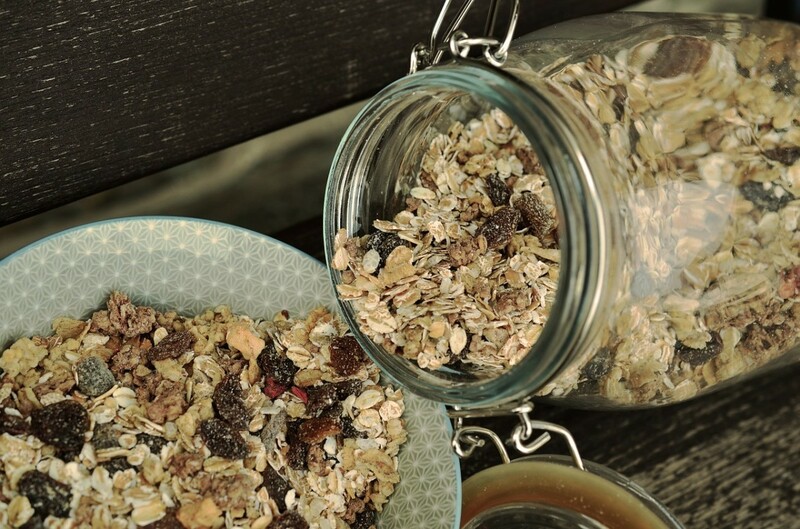 Proponents of sprouted grains claim that eating a grain in sprouted form provides several health benefits compared to eating it in an unsprouted form. They say that the sprouting process increases the vitamin levels in the grain. They also say that phytic acid is broken down during sprouting. Phytic acid binds with minerals such as calcium, iron, and zinc, making it harder for our small intestine to absorb them. When phytic acid is destroyed, more minerals are available. It's also said that sprouting makes grains easier to digest. Sprouting grains does provide the claimed nutritional benefits, but some scientists wonder whether the benefits are large enough to be significant. Researchers say that sprouted grain breads are good for us even if sprouting the grains doesn't significantly increase their health benefits, however. The breads are made from whole grains, are minimally processed, and tend to include healthy ingredients and omit less healthy ones. The Manna Organics website says that all the ingredients in their products are GMO-free. GMO stands for Genetically Modified Organism. It's a classification used to refer to a plant, animal, or microorganism whose genetic material has been altered by humans, generally in an attempt to improve a useful property or behavior of the organism. Some people are very concerned about the consequences of changing an organism's genetic material, or genome, especially when it's done in a plant or animal that is eaten by humans. The behavior of genes in a living creature is very complex and isn't completely understood by scientists. It's possible that altering a genome may have unexpected and detrimental consequences. All of the ingredients in the bread listed below are organic. The main ingredients are sprouted; the others aren't. The ingredients were correct when this list was created. Ingredients of a product may change over time, however. Gluten is a protein complex that is present in certain grains. It's very important to note that although there are chemical changes in a grain when it sprouts, sprouted wheat, rye, and barley still contain gluten. 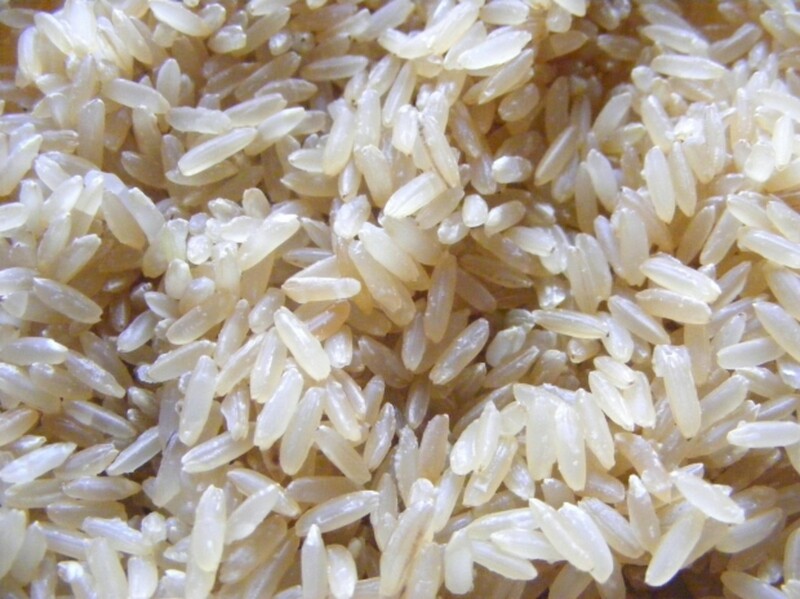 Oats may sometimes contain gluten as well. Check with your doctor if you have celiac disease and want to eat oats. People with celiac disease mustn't eat any version of manna bread. In this disease, the tiny projections on the lining of the small intestine, which are called villi, are damaged and destroyed due to the presence of gluten. This greatly reduces the absorption of nutrients. Celiac disease can produce a long list of very unpleasant symptoms. In addition, it can sometimes cause serious complications. People with celiac disease must completely avoid gluten in their diet. They also need to ensure that anything that enters their mouth—such as toothpaste—is gluten-free. Even a small amount of the protein can trigger damage to the villi. If you can't tolerate wheat but can eat other gluten-containing grains such as barley and rye and if you have also tested negative for celiac disease, you might want to try sprouted grain wheat products. Some people who develop problems when eating wheat find that sprouted wheat suits their body better than wheat that hasn't been sprouted. Some people may choose to eat manna bread because they're yeast intolerant. Others may want to avoid the high sodium content in many other breads or they may wish to avoid added sugar or preservatives. Manna bread is not gluten-free, however. There may be some disadvantages to buying manna bread, even for people without celiac disease. The bread is not the best type for making sandwiches, for example. It's a dense and moist product that doesn't have the soft, spongy texture of flour bread. For me, this isn't a disadvantage, however. 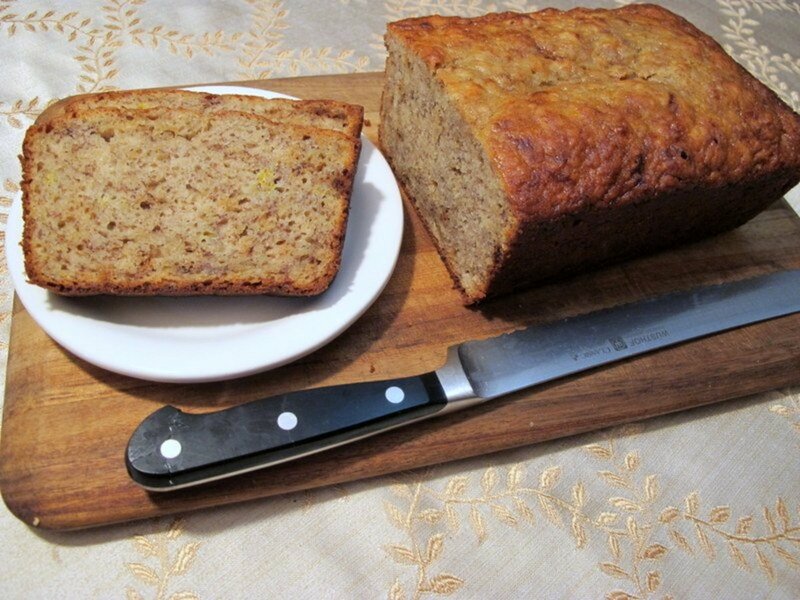 I treat manna bread like a healthy version of cake, even though it doesn't have the texture of a cake. A slice of manna bread with a nut butter spread on it is delicious as a snack or as a meal accompaniment. I buy a different type of bread for making sandwiches. Manna bread could be used to make sandwiches if a person is determined to do this. One problem with this idea is that the bread is sold in small loaves, each of which is quite expensive compared to many regular brands of sandwich bread. In my area, the varieties without fruit cost about $4.20 Canadian, while the varieties with fruit cost about $4.70. The healthier flour breads and the sprouted grain breads with yeast cost the same amount or even more than the manna bread, but they are sold in bigger packages that last longer. Using manna bread to make daily sandwiches in a family with several people could get very expensive! Another problem with using manna bread to make sandwiches is that the slices made from a loaf are smaller in area than the slices produced from a loaf of sandwich bread, unless the manna bread is sliced lengthwise. Manna Organics brand manna bread is sold frozen (at least in my area). When it's defrosted it needs to be kept in the refrigerator and eaten within a few days, since it doesn't contain preservatives. I happily accept this "disadvantage", however, because I like to avoid preservatives in my food. To me, having no preservatives is an advantage, not a disadvantage. All of the brands of manna bread that I've seen in stores, included the brand that I buy, are wrapped in a plastic bag. In fact, each Manna Organics loaf is packed in two plastic bags—an outer one and an inner one. This is okay if the purchaser conscientiously recycles all their plastic and if their recycling depot accepts bread bags, but not if these requirements aren't met. Plastic garbage is a serious environmental problem, especially for animal life. Most plastic either doesn't degrade or takes many years to do so. People who are allergic to soybeans must avoid the multigrain version of Manna Organics manna bread, since the beans are one of the ingredients. 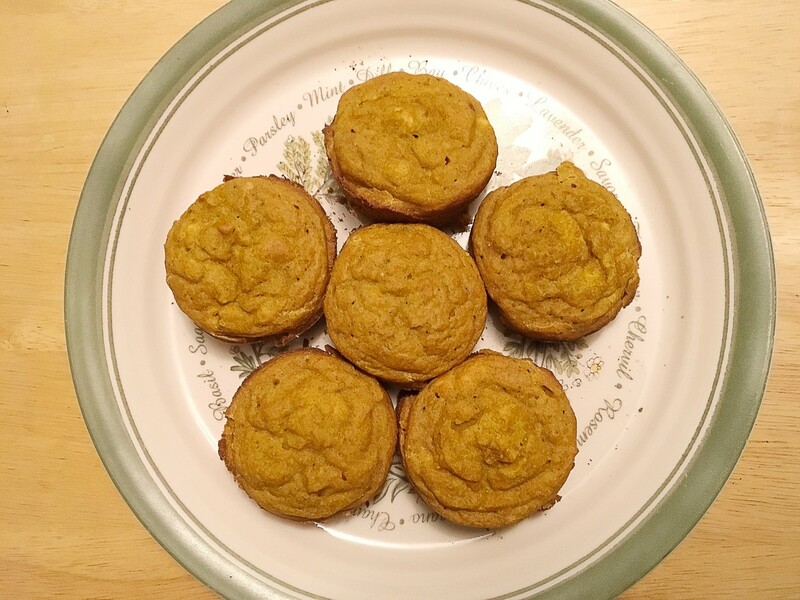 The multigrain manna bread also contains corn, which causes an allergic reaction in some people. If you have a nut or seed allergy, or if you wish to avoid certain seeds, several varieties of the bread will have to be avoided. Luckily, there are nut and seed-free versions of the bread, as the table above shows. 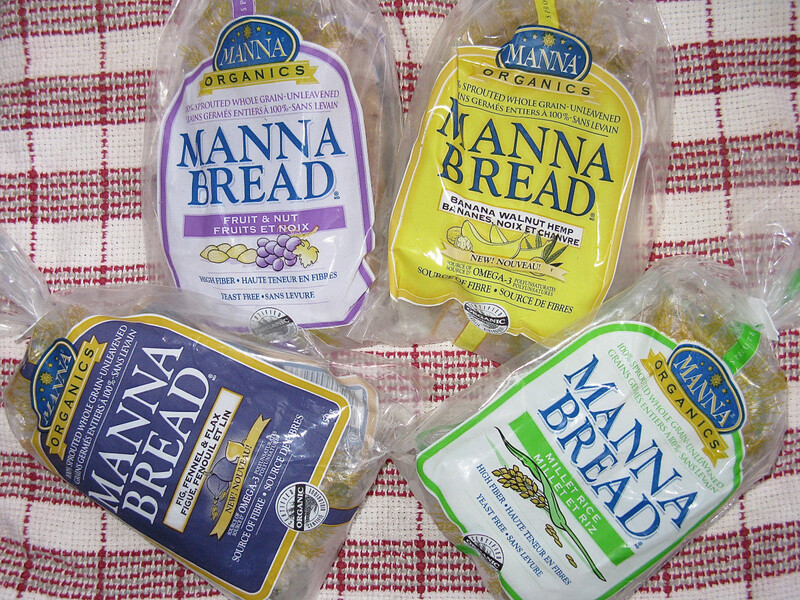 Which variety of manna bread appeals to you the most? 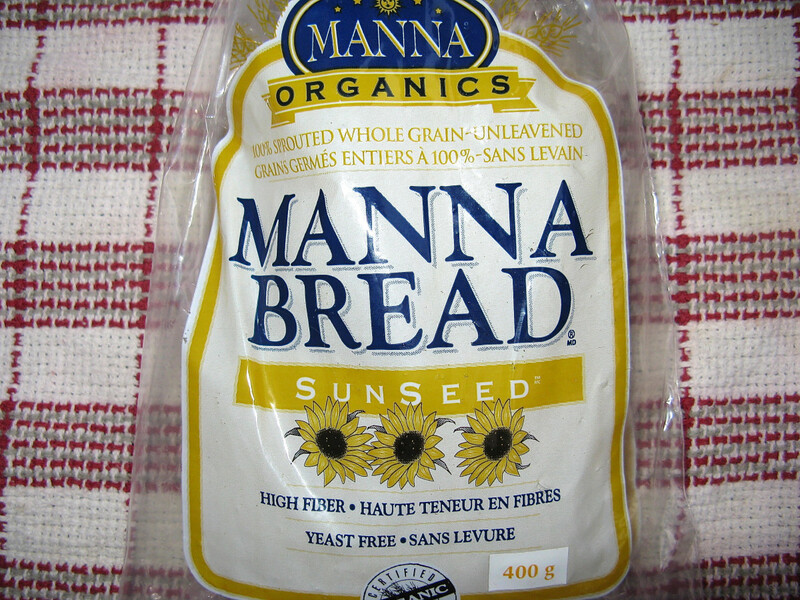 Manna Organics LLC manna bread is sold throughout North America as a frozen product. It's generally sold in health food stores, although I have occasionally found it in a supermarket near my home in British Columbia. The company's website says that the bread is sold in "most" Whole Foods markets. I've seen it in the markets in my area. The bread can also be bought from the online store on the Manna Organics website, but since it needs to be transported in a frozen form the store only sells it to United States addresses. The nutritional information for each variety of bread is printed on the outer bag. Some people like to know this information in advance. The "Manna Organic Bakery" website provides the details. To find them, you need to click on the "Organic Breads" link on the home page and then click on the variety of the bread that interests you. A link to the nutritional content is provided under the name of the bread. Manna Organics manna bread is one of my frequent purchases and has been ever since it was produced by Nature's Path. I don't have the bread in my refrigerator or freezer all the time, but I buy it often. The nine varieties give me lots of different flavors to choose from. I choose the plainer kinds most often and save the sweeter ones for an occasional purchase. I like incorporating the bread into my diet for both its nutritional benefits and its taste. How many carbs in a slice of Manna Bread? Is this considered a good form of protein? How does it affect blood sugar? If you go to the manna organic bakery website and click on the variety of bread that interests you, you'll find a link to the nutrient content. This will enable you to discover the carbohydrate and protein level. If you have other questions, such as the effect on blood sugar, the website has a "Contact" link that enables you to email a question to the company. Where is grain manna bread sold in the Cincinnati area? If you do an Internet search for manna organic bakery you should find the company's website. The site has a Store Locator link on its home page. This link enables people to enter their location and then find out where the company's products are sold in that area. The home page also has a Contact link. I live nowhere near Cincinnati and don't know where manna bread is sold in the area, but I think the website may be very helpful for you. Hi, Ron. Go the the Manna Organics Bakery website. Based on the current organization of the website, you’ll need to click on “Organic Breads” in the menu bar. Then click on the photo of the bread that interests you. Finally, click on the “Nutritional Information” link. 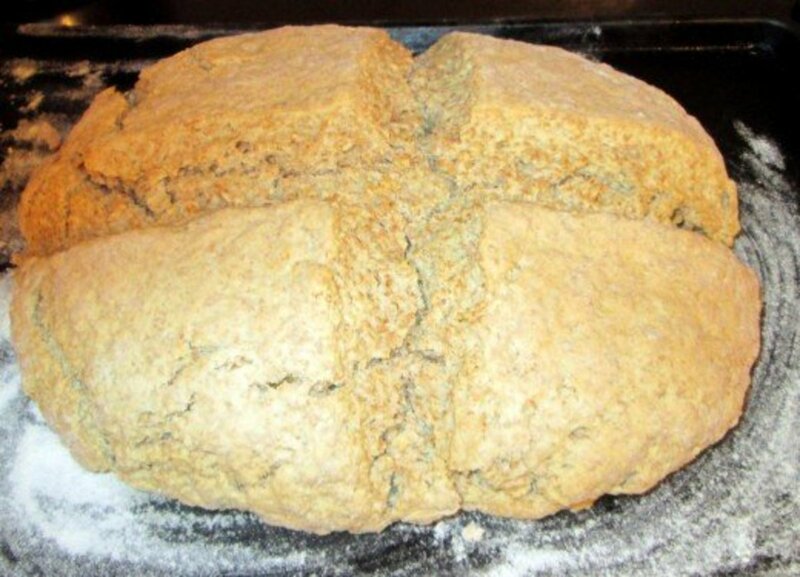 This will give you the quantity of carbohydrates and other nutrients in one serving of the bread. The company that makes and sells manna bread in mentioned in my article. Their website has a store locator, which should be helpful for you. Fruit and nut manna bread is definitely a delicious variety! Thank you very much for the comment, Virgo Rouge. I hope you like manna bread if you try it, poetryman. Thanks for the visit. I am not sure I will like it but I would like to try some of this bread. Hi, Beverly. I think you may be confusing corn and wheat. Most corn in the United States is GMO Corn, but GMO wheat is still in the experimental stage. Neither GMO crop has been in production for forty years. 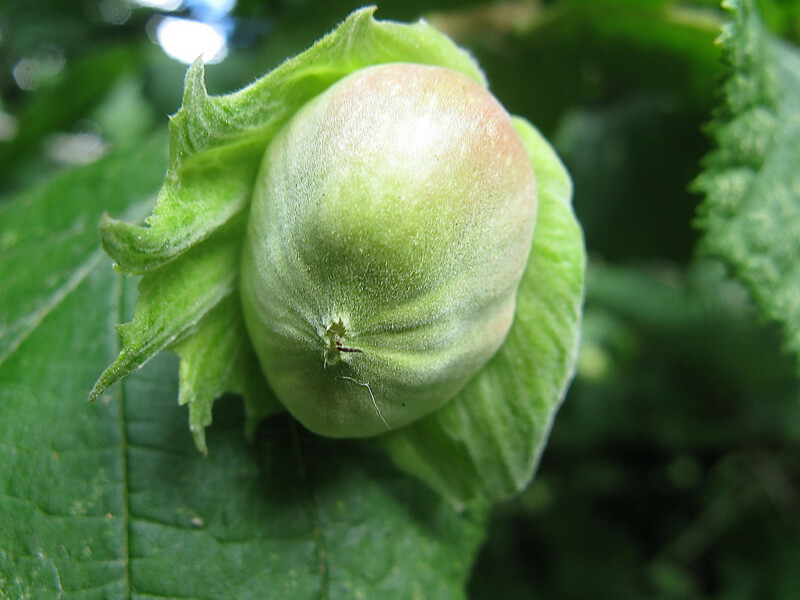 Humans have used selective plant breeding for a long time, but this isn't classified as genetic modification because no genes are added to the plants. 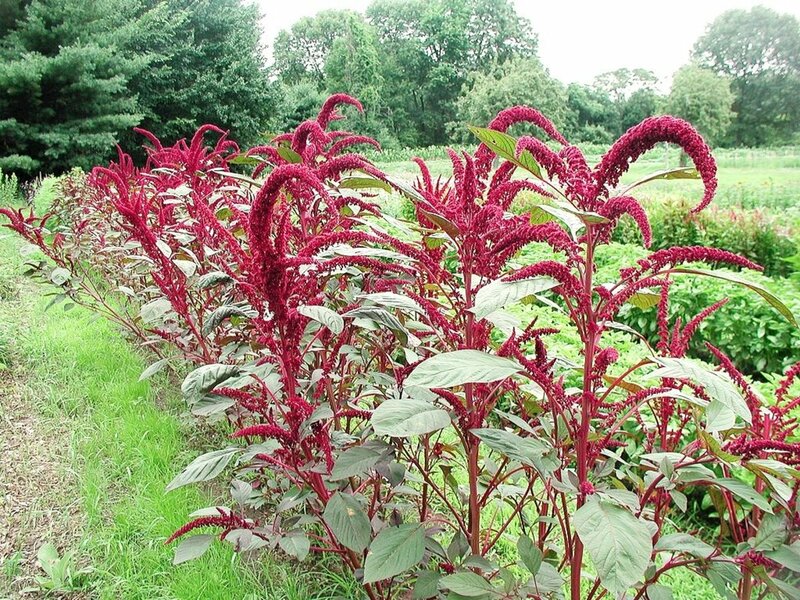 The mixture of genes occurs naturally as the plants reproduce. How can Manna bread say it's non-GMO, if modern wheat is severely GMO for the past 40+ years? Anything with wheat is automatically GMO. Thank you very much for the comment and the share, Peg! It's nice that manna bread is both healthy and tasty. I like the selection of flavors, too. This is wonderful. I love the looks of the manna bread and its wholesome content is just what I was looking for to start off the new year right. I'll be sharing this hub! 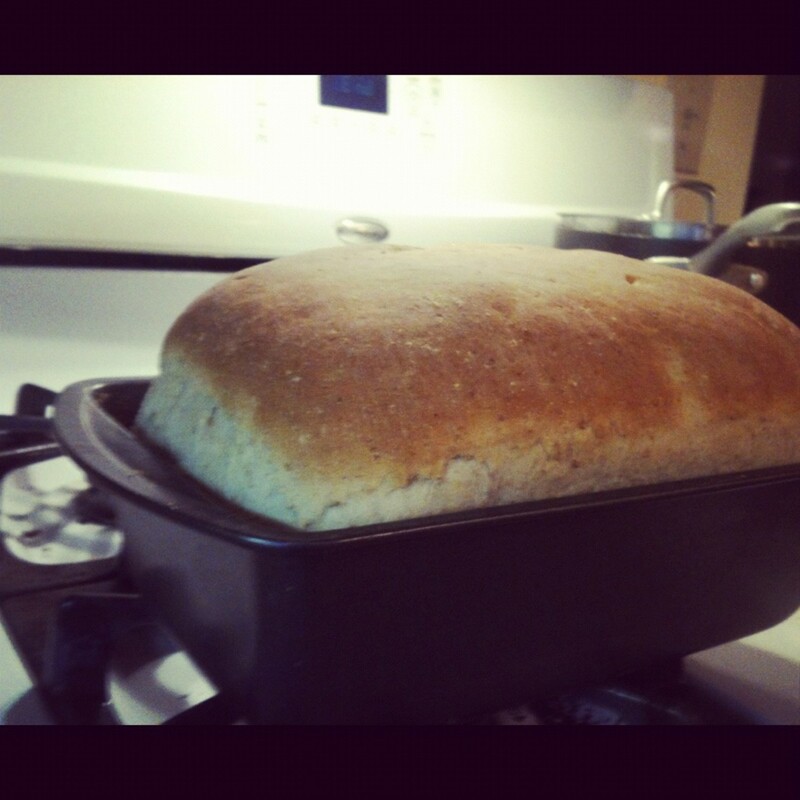 I love the taste of homemade bread, especially when it's fresh out of the oven! I'd like to make it more often. Thanks for the visit and the comment, Kathi. I liked your video, you did a nice job. Hmm, Suddenly I want to make some manna bread! Truthfully, I've been making my own multi-grain bread using whole grain flour, but I never heard of this. I want to give it a try cause it's even healthier. Thank you very much for commenting and for the congratulations, Sunshine625! Thank you for the congratulations and the comment, Carly! I appreciate your visit and vote. Thank you very much for the comment and the congratulations, greatstuff! Thank you so much, sgbrown! I appreciate your congratulations and the lovely comment. Congratulations on winning the grand prize. Very informative and well formatted hub. Well done. Thank you for the comment and the congratulations, Les Trois Chenes. I appreciate your visit! Congratualtions on your win. Lots of work here & great information. Thank you very much, Denise - and congratulations on your win, too! I love your review of the bird sanctuary. Thank you, GoodLady!! I appreciate your congratulations very much. This is such an exciting day! Thank you, Happyboomernurse! I appreciate your comment very much! Thank you very much, renegadetory. It's so nice to meet you. Congratulations on your win, too - I'm looking forward to reading your hub! Thank you so much for your kind comment, cclitgirl! I appreciate your visit and congratulations! Congratulations super lady for this worthy Hub. Congratulations on earning the Grand Prize in the Rigorous Review Contest!!!! I think the judges made an excellent choice. Congrats on winning! I see you are from Canada too! I love all your pictures and quite honestly, I never knew there was such a thing as manna bread. After reading your hub, I will definitely try it out! Congratulations for winning the Contest Review - grand prize!! This hub is truly wonderful and is a fantastic explation of manna bread. I had no idea what it was before reading. Fabulous hub! Congrats again! Thank you for the congratulations, Happyboomernurse! I appreciate your comment very much. Congratulations on your Rigorous Review Contest win for this worthy hub. I've never heard of or eaten Manna bread, but after learning so much about it's nutritional benefits it sounds like it would be good to try it. Thanks for the visit, RTalloni. I appreciate your comment. Thanks for this educational review of Manna Bread. It's very informative and interesting. I'll definitely be looking for this food product soon. Thank you very much for the visit and the comment, Eddy. A brilliant hub and thanks for sharing. Hi, Deb. I'm in a somewhat similar situation. I don't have celiac disease either, but I have a wheat sensitivity. Things are easier for me than for you, because I can eat small amounts of wheat, but if I eat too much I experience heartburn and nausea. I find sprouted grains easier to deal with than non-sprouted ones. Manna bread doesn't cause me any problems, although I'm careful that I don't eat it at every meal. Thank you so much for the lovely comment, drbj. I appreciate it! Alicia - this has to be one of the most thorough explanations of a subject - in this case, manna bread - that I have ever read on HP. Kudos to you for your diligent research and common sense presentation. Thank you for the comment, GoodLady. I want to grow some sprouts myself. I've done it as part of school experiments, but never for food. It should be fun! It's a meal in itself! Will pop by our herb shop to see what grains they have to sprout and give it a try - but I wonder if I can buy it on Amazon? Sounds lovely with the nut butters. Thanks, it's precious.